How does this integration help me? Tidio Chat is the fastest and easiest way to connect with your knowledgebase visitors in real-time. With Tidio Chat embedded in your ProProfs site, your support staff can answer questions and guide visitors to relevant documentation directly. Customers get their questions answered immediately and leave your site feeling satisfied. Use Tidio Chat to offer real-time support in your knowledge base. Guide your website visitors to relevant documentation via chat. With a chat embedded in your help site, you can see who is on your site, including their location, what they’re viewing on your site, and the time they spend on the site. Even when a support staff is not online, your knowledgebase visitors can instantly reach you by sending an offline message in the chat box. To get started, you need to create a TidioChat account. After you sign up, go to Integrations, to get the code. The next step is to install TidioChat in ProProfs. Log in to your account (as an administrator), and click Settings > Add, Edit, Customize Sites. Select the site you want to install it for. Locate the section where you put code that runs before </body> and paste in the code. Once you install TidioChat, you never have to add the code to ProProfs again. 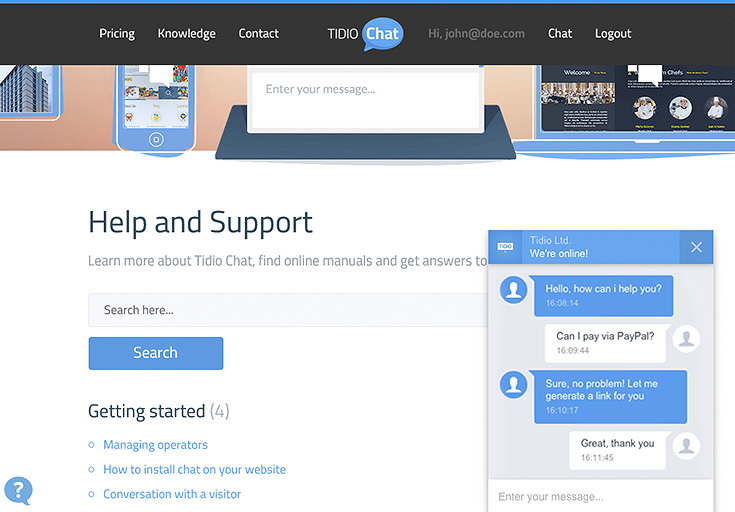 All changes you make inside of TidioChat will instantly update your chat configuration. To test, log in to your TidioChat account and enable chat. Then log out of ProProfs and go to your site's home page. A chat window should appear. Chat will ONLY run for logged-out users. Logged-in users will not see the chat option. Select the site you want to remove it from. Click on the Integrations tab. Locate the TidioChat code and delete all of it.